Crude prices this morning are $46.63, up 1.2% from yesterday’s close. Crude opened at $46.08 today, $.64 higher than yesterday’s opening price. Interestingly, today’s price broke through the 50-day moving average price of $46.54, which is an indicator of bullish market sentiment. 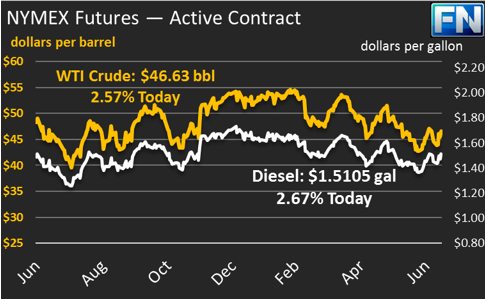 Diesel price are $1.5105, with a significant loss of $.0188 from yesterday’s close. Prices opened this morning at $1.4940 this morning, $.02 higher than yesterday, and have been boosted by rising crude prices so far today. Gasoline prices are $1.5456, gaining $.0195 since closing yesterday. Prices opened at $1.526, $.01 higher than yesterday’s opening and $02 lower than current prices. News this morning has been light. The market’s focus has been on Thursday morning’s report from the IEA that OPEC supply grew in June, while overall compliance levels fell. The report also indicated that oil demand would accelerate in the second half of 2017, pairing the bullish and bearish news together. Earlier this week, the EIA posted an updated Short-Term Energy Outlook. 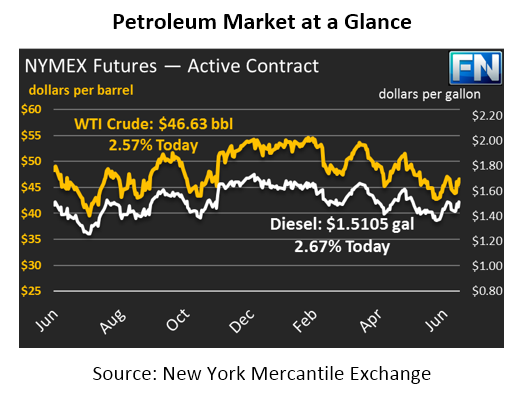 The agency forecasts that WTI crude will average roughly $49/bbl in 2018 and $50 in 2019, a significant change from earlier calls for $60+ prices in 2018 and 2019.